French composite output PMI fell to a 50-month low of 47.9 in January, indicating contraction of the economic activity. German manufacturing slips to contraction in January while the services sector increases. 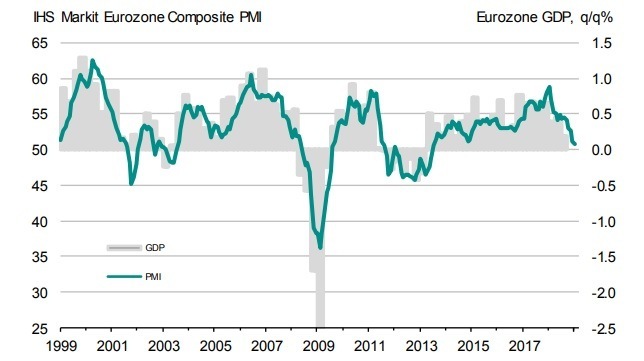 The Eurozone composite PMI fell to a 66-month low of 50.7 in January indicating that the first quarter GDP is just 0.1%. Eurozone composite PMI in January fell to a 66-month low of 50.7 in January indicating that the first quarter GDP is just 0.1%. Apart from the yellow vest protest in France, the global demand deceleration stemming from ongoing trade tensions weighed on the activity. The Eurozone manufacturing PMI fell to the lowest level in 50-month of 50.5 in January as German manufacturing PMI slipped to contraction territory of 49.9 for the first time in last 50-months. French composite private sector activity fell to a 50-month low of 47.9 as the yellow vest protest led to the steepest decline in the economic activity in France since November 2014, consistent with GDP falling in the first quarter of 2019. The services sector in France suffered a sharp deceleration to a 59-month low of 47.5 while manufacturing ticked up to 51.2 in January. The services sector PMI in Germany rose to 53.1, but the manufacturing sector slipped to a 50-month low in contraction territory of 49.9 in January. The slowdown of the Eurozoen economy continues and the ECB is likely to reflect it in its comments while the Governing Council is meeting today, following the International Monetary Fund (IMF) that lowered the global advanced economies growth projections mainly because of lower than expected growth in the Eurozone.